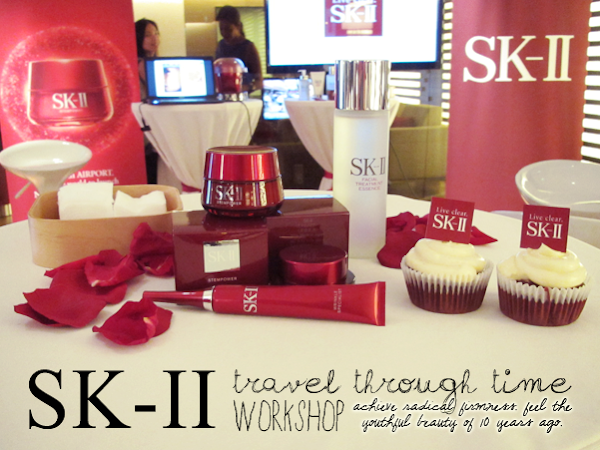 On May 23rd, I made my way to JetQuay CIP Terminal for SK-II's Travel Through Time Workshop! We had our own ride to the elite airport terminal to rewind time with SK-II and discover the 'youthful beauty of 10 years ago'! For those who don't know about JetQuay CIP Terminal, it opened in September 2006 to provide personalized checking in, baggage handling and immigration clearance services. It welcomes any passengers travelling in any class and at any point of their journeys (Arriving, departing and transiting). The terminal comes equipped with a business centre, private meeting rooms, board rooms, showers, day rooms, a contemporary art exhibition, cable television and free internet access. 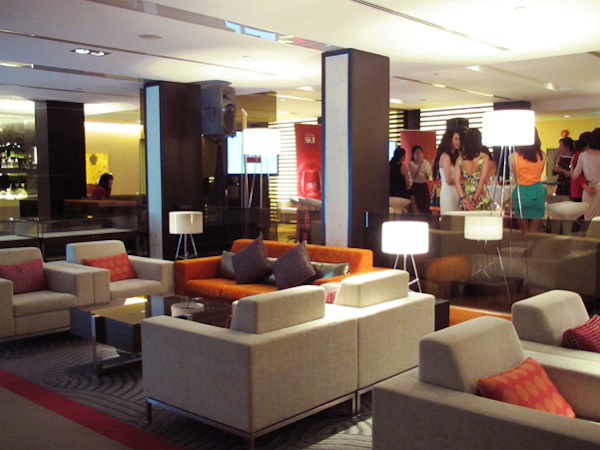 It was beyond lovely, supremely classy and pretty apt for the event! I really love events because not only do I get to touch base with founders, scientists etc. (Among a multitude of other reasons, of course! Like new friends! :D) and learn more about products, I also get to go to places which I have never been before! 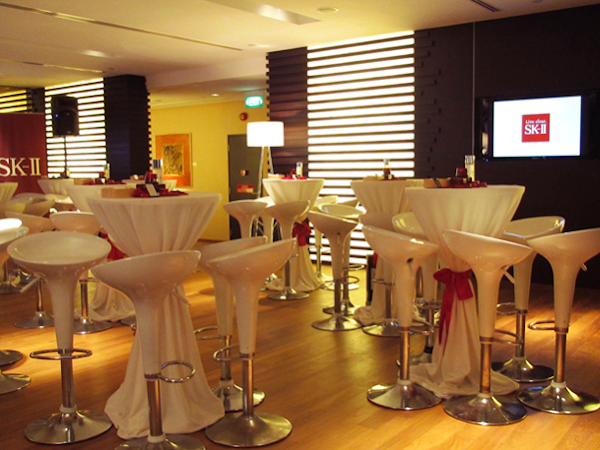 And here's where the stage is, with chairs and tables draped in the brand's signature red and white colours. 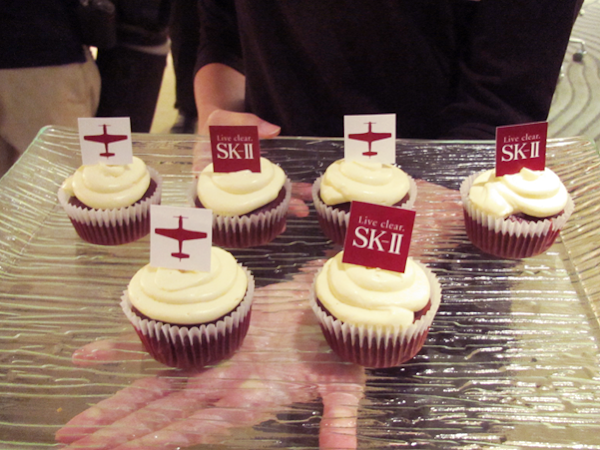 The workshop marked another milestone in SK-II's history with her newest anti-ageing innovation, STEMPOWER! This magic potion takes the form of a daily moisturizer formulated to take 10 years off your face! This means radical firmness (Defined as skin that is significantly and visibly firmer.) and most certainly, your youthful beauty of 10 years ago! SK-II has had numerous 'first's in various beauty categories and of course, probably the most important one, anti-ageing, cannot be let off. With the launch of STEMPOWER, the brand seeks to control the chess board in the anti-ageing category. By targeting the root of skin problems brought upon by time, STEMPOWER hydrates, reduces the appearance of pores, smooths textures and firms up the skin. STEMPOWER's foundation lies in Stem-Acanax, a unique plant-derivative extracted from the Siberian Ginseng root. Add SK-II's Pitera to the equation, and you get the SK-II Stem-Acanax Complex! And it is this complex that 'stimulates epidermal root cells to promote the production of life-proteins in the skin's basal layer, which enhances skin's springy structure and rejuvenates the skin renewal process, a critical factor in improving skin plumpness'. There are 3 types of climates that travellers experience; their current location, in the airplane and at their destination. Skin loses moisture due to the cold and dry cabin air, so load up on the serums and do post-flight care. Mask before and after the flight to keep your skin hydrated. During the flight process, go barefaced or use light makeup. The myth that layering on makeup protects your skin is false! Use a facial spray (Make your own by pouring a little of SK-II's Facial Treatment Essence in a spray bottle!). Love, Bonito's Viola was present as well to give her SK-II's story. She was really gorgeous and her skin was just completely smooth and flawless! 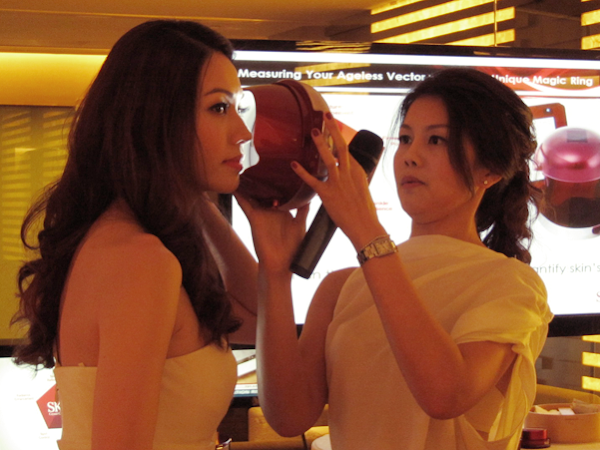 Nitiwadee Songrienchai, ASEAN SK-II Beauty Consultant Training Manager from Procter & Gamble Trading (Thailand) Co. Ltd, did a analysis on Viola's skin using SK-II's technology. And here's a video of Nitiwadee teaching us her massage exercise for the face, taken with my iPhone! 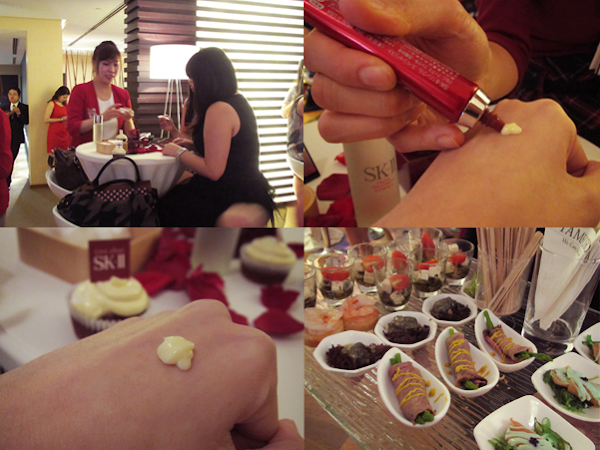 Snapshots of us trying out SK-II's latest STEMPOWER range! Besides the moisturizer which I have been talking about, there are also the STEMPOWER Rich Cream and STEMPOWER Cream Compact Foundation that will be available come August! The former is a more intense version of the STEMPOWER, with 49% more skin conditioning ingredients. The latter contains SPF20 PA++ and is formulated with the essence of STEMPOWER so that the much-coveted rosy complexion is made possible (Totally excited about this!). And her skin is flawless. ZERO visible pores, I tell you! I don't know about you, but I find that as I grow older, time seems to go by ten million times faster. Perhaps, it's because we are more aware of time or maybe it's due to the fact that we are busy 24/7. Where skin is concerned, even though I'm considered 'young', I find that my skin is no longer oily and has gone over to another dark side; drought. Dry skin makes your face a very rough canvas for makeup and a breeding place for lines. So I do concur that anti-ageing needs to be started young. Do get your skin analyzed by the beauty consultants so that the right products can be prescribed to you. 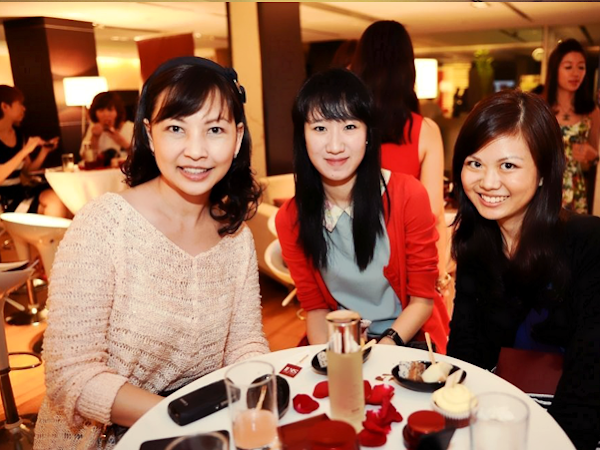 (: SK-II's Beauty Consultants are always happy to help! 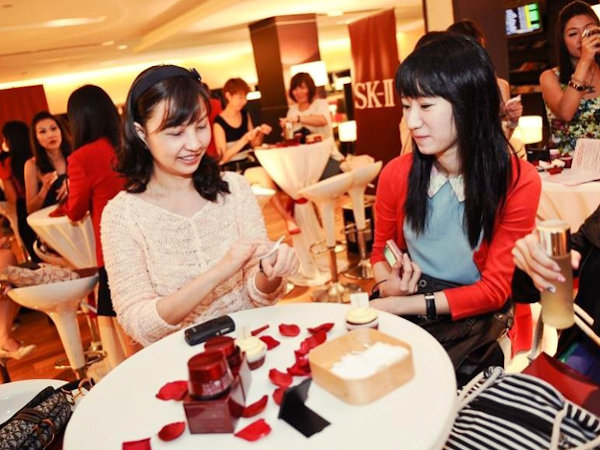 The SK-II STEMPOWER is available at SK-II counters in Changi Airport, 50g at $149 and 80g at $219.